Those of us who live in the Minnesota area are very lucky to enjoy all of the gorgeous bodies of water the area has to offer. Whether your passion is swimming, fishing or just cruising on the open water, you have endless possibilities in our beautiful area. And, if you are lucky enough to be a boat owner, you can enjoy the water anytime you wish (weather permitting of course!). If you are like many, however, you may never want to take a break from the water during the spring and summer months. So, when your boat needs a minor repair, renovation, or falls victim to a collision or storm damage, you want to partner with a team that can help minimize the time spent in the repair shop and maximize the time spent on the water. 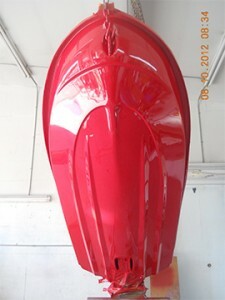 Anchor Marine Repair specializes in all types of boat repairs for those in the MN area. Our team shares your passion for the water and will work to get your boat back in the water as soon as is possible! State of the art repair facility: Our facility is located near Lake Minnetonka and is over 10,000 square feet. It can accommodate boats all the way up to 38’ in length and has two spray booths. We use only the highest quality tools and equipment to work on your boat. Expertise in many types of boat repair: We can complete aluminum boat repair, chaparral boat repair, boat painting, metal flake repair, renovation, transom repair, boat windshield repair, fiberglass repair, and Mastercraft Boat repair. No job is too small or too large for our boat repair experts. Longstanding staff committed to doing high quality work: All members of our Anchor Marine Repair team have been with us at least 10 years or more and all together we offer a combined 45 years of boat repair, renovation and refurbishing experience. Pickup and delivery services available: Our team also understands that it might be difficult to transport your boat, so we offer pickup and delivery services within 250 miles of the Minneapolis/St. Paul area. And, estimates and consultations are always free! So, if your boat needs repair or renovation this season, trust the team at Anchor Marine Repair to complete the job right and fast. Call us today at 763-972-3540 to speak with one of our experienced technicians about your boat repair needs.